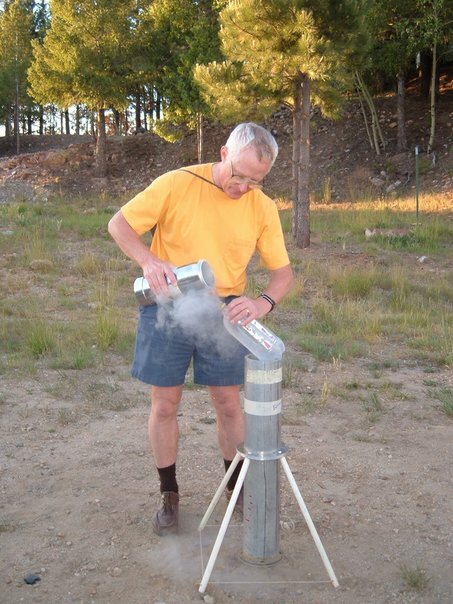 In a typical launch, the explosive force of a plastic 2-liter "soda pop" bottle, rupturing under pressure from evaporating liquid nitrogen (LN2), sends another 2-liter bottle filled with water over 400 feet into the air. Such experiments help demonstrate various principles of physics, engineering, and chemistry, including pressure, evaporation, Newton's laws of motion, ballistic motion, etc. They also provide opportunities for campers to predict and measure force, altitude, time aloft, velocity, and acceleration. 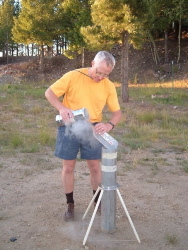 This and other liquid nitrogen experiments have traditionally been an exciting "learning experience" at Astronomy Camp. In one such activity, students become engineers and consider the design of a spaceship for traveling to the cold temperatures (-320 °F) at Saturn.